EOTopo is a high resolution topographic map of Australia that is feature-rich with verified point of interest & campsite markers. Australia-wide road and track coverage is extensive and has been fully updated in our latest 2018 version. From this page you can read about the product and determine which format is right for your needs. Please check the Help & FAQ section on this page for detailed information. You can also view the EOTopo online map from this page - noticing that as you zoom more detail is revealed, right through to 1:18,000 scale (18K). EOTopo comes in various product sets, with a range of output formats, scales and file formats as described below. EOTopo is a high resolution topographic map of Australia that is designed for touring and 4WD explorations, yet provides enough street detail to find your way around regional localities and small towns. EOTopo is the best map available for people that love touring, camping, and exploring and is suitable for all on-road and offroad adventures. The map displays everything of relevance to travellers, including natural landforms and man-made structures. 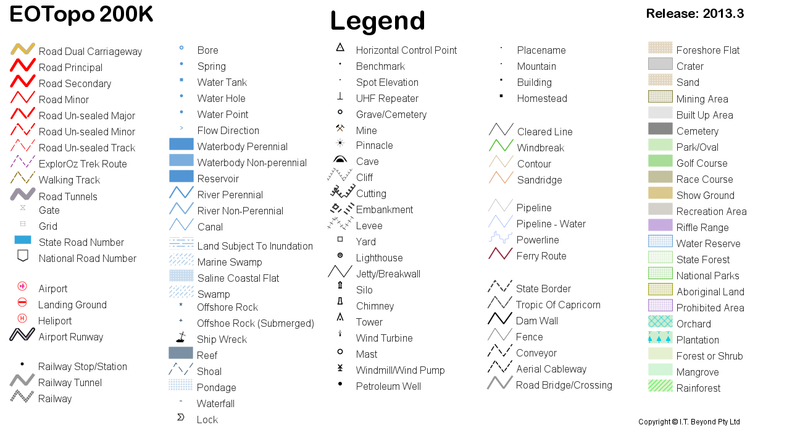 Symbols show location of bush camps, caravan parks, aboriginal communities, stations/homesteads, roadhouses, airstrips, quarantine, P-Bays and other infrastructure, plus natural features including rivers, lakes, mountains. Names are shown for towns, localities, aboriginal land, roads/tracks, as well as distance markers in kilometres. A conflation of road data sources allows the map to have the optimum detail for use whether in urban areas or in outback areas. This is due to the street level roads data being derived from the latest OSM source and outback road data derived from the ExplorOz Topo Roads source utilising field-checked data recorded whilst driving using GPS. This results in the entire source data being highly detailed to the best possible level for the whole of Australia, without any need to use any other map source. This is the only map you'll ever need for travelling Australia, whether you drive the highways or explore the remote desert regions. The full EOTopo whole of Australia map is available to view online for free. This online version utilises our own mapping engine so you can view the map without using any other mapping software. The map can be zoomed with more detail revealed as you zoom in closer with a max zoom visible at Level 16. At this level, you are viewing the map data at 1:18,000 map scale (18K). You can view EOTopo online free on the ExplorOz website using any device that has a web browser (ie. Chrome, Safari) or within our GPS Navigation app ExplorOz Traveller. EOTopo 2018 can be used offline by purchasing a lifetime license to download map files that must be installed into compatible software to view/use for navigation. The map data is extracted from the master source using the latest in raster tile production techniques to ensure best quality resolution is maintained whilst keeping file sizes manageable and practical for today's modern devices and internet speed. For this reason, we can deliver the most detailed offline map of Australia on the market today, at a scale of 144K in a 4.3GB ECW file. Purchase of the EOTopo map license enables you to select from the full set of raster file formats for a range of map scales up to 144K. Simply select and download the files that are relevant to you, ensuring you have compatible mapping software with which you will open/view the map files (eg. OziExplorer, Track Ranger, Hema Navigator HN7). Note: we only provide map files in ECW and OZF formats. Please check your navigation software manual for compatibility. TIP: if you'd like to see the level of detail that is available in these offline maps, simply set the zoom level to number 13 in the EOTopo online map screen. At that level you are viewing map data at a scale of 144K. NOTE: customers who purchase EOTopo will get a dual license that also activates the Premium Offline Map Pack in the ExplorOz Traveller app. For more information see ExplorOz Traveller. EOTopo purchased from ExplorOz is licenced to a single customer by name/email address, which is registered in our database. Each licence allows use on any device owned/used by that customer. Because roads and other topographic features can change, updates are required to keep maps current. The Lifetime Upgrade Plan means that we offer our customers access to EOTopo map version updates at a discounted price so that you don't have to pay full price when new versions are released. This upgrade plan will stay with the customer for the lifetime of the product. Licensed users will receive notification of a major release along with instructions/options for how to obtain the upgrade. See EOTopo Updates section to see frequency of updates (eg. approximately every 2 years). EOTopo is licenced to a single customer by name, which is registered in our database. Each licence allows use on any personal devices owned/used by that customer. The data provided via this download service (MEDIA) contains material which is Copyright I.T. Beyond Pty Ltd. All information, text, material, graphics and software (CONTENT) on the MEDIA are Copyright © 2019 I.T Beyond Pty Ltd. The CONTENT is protected by Australian and international copyright and trademark laws. You must not modify, copy, reproduce, republish, upload to a third party, post, transmit or distribute this CONTENT in any way except as provided for in this User Licence. I.T. Beyond Pty Ltd provides no warranty regarding the accuracy, completeness, currency or suitability for any particular purpose for CONTENT provided on this MEDIA. EOTopo incorporates Data which is © Commonwealth of Australia (Geoscience Australia) 2008. The Data has been used in EOTopo with the permission of the Commonwealth. The Commonwealth has not evaluated the Data as altered and incorporated within EOTopo, and therefore gives no warranty regarding its accuracy, completeness, currency or suitability for any particular purpose. EOTopo incorporates Data which is © OpenStreetMap contributors. You have not purchased any EOTopo Download product or are not logged in. You have access to the Free Downloads only. If the text colour is black you may download this item. If the text colour is green this means you have already downloaded this item, however you can download it again by clicking. If the text colour is red you do not have the license and cannot download this item. Purchase the EOTopo raster mapset in raw map file format - ECW and OZF4 for use in Hema navigators, OziExplorer or other compatible mapping software. Only available from ExplorOz - click here. This is a preview release showing the work we are doing with Vector map delivery for both the ExplorOz Traveller App and also the web based mapping systems. This map supports zoom to level 22 however it may be reduced in final as anything above 19 is difficult to use in reality. Also the map supports rotation and 3D views. We recommend using the Chrome browser for best performance. The following blogs allow you to review exactly what changes have occurred in each version update to EOTopo. The 2018 version of EOTopo Raster Maps were released today for sale (via the ExplorOz online shop).The 2018 release contains 2 options, either the Standard or Premium mapsets. The Standard map set contains a collection of map files for the whole of Australia and separate State files in a range of map scales. The most detailed scale in the Standard product is 200K (which is the same scale as previous releases of EOTopo). The Premium map set contains all the same map files and formats as the Standard map set but with the added inclusion of maps in the 144K scale. Both products contains duplicate maps, one set in ECW format, and another set in OZF format. The OZF 144K map set in EOTopo Premium does not include a single Australia file due to technical limitations with file size. However you just use the 6 State 144K files or the ECW 144K Australia file. Whilst OZF is optimised for use in OziExplorer, the ECW file is also compatible. - Release 2018 is a major update which brings street level details into the road network using the latest OpenStreetMap dataset. This however is not a straight data conversion process, the OSM data is seriously lacking regional and outback data and has many metadata issues. A major part of the 2018 release and bringing these data sources together involved a massive task of data conflation (a process to evaluate each data element and a keep/reject or update function was applied to the topo databases). This conflation then allowed the production of a map that contains the best bits from each of the databases. This process also involved addressing metadata issues and dealing with high scale data in a mid scale product. The 2018 product in vector and online formats is being rendered to down to a 1:18K scale with good accuracy with the possibility of getting close to 1:1.1K in our vector based products which we intend to release later in the year. - In the 2018 release new places extracts from Dec 2017 were used and a large number of datasources were updated including, ABS Mesh Boundaries, Native Title, Water Bodies, Oceans & Seas, coupled with OSM datasources. - State, Regions and Suburb data has been obtained from the Australia Bureau of Statistics using a mix of November and December 2017 data. - Native Title boundarys has been obtained from the Australian Government and in this release is using December 2017 data. As part of our rollout of the new EOTopo 2018 maps, we have released a new version of the ExplorOz Traveller app. Existing app users need to install the latest update, which is Version 3.0.0 (now available in the Playstore for Android, and in the App store for iPad and iPhone, and Windows Store for Windows 10 devices). App users who already own the EOTopo Premium Offline Mapset can update to the 2018 mapset for free within the app. EOTopo 2018 BETA has been published for preview to generate feedback from the audience prior to public release for sale in 2018. This is an online preview intended to show the roads update that has been the major component of this update. To view the new data, please visit the EOTopo page and click on EOTopo Online. During 2018 BETA, EOTopo online will continue to show a max zoom of Level 13, which is a map scale of 144K (1:144,000). Once we go to production, we will be adding 3 additional zoom levels to a max of Level 16, which is a map scale of 18K (1:18,000). A new minor version of EOTopo was released today being 2015.1. This update added a data layer that was removed from previous release of EOTopo as it was at the time decided that the 'Shaded Relief' layer would supersede the 'Deformation Areas' layer. A re-evaluation of the 'Deformation Areas' data layer was undertaken and a decision to re-instate this data was made. This update only affects the the 200K series maps and all other scales have retained the 2015 version numbers. During this update a new import of the ExplorOz Places data was undertaken and the POI data both on the 200K maps and in the Name Search files is current as at 19 Jan 2015. Additionally on the 200K maps the POI symbol images were reduce in size by approx 20% this recovers some map detail around the POI's whilst maintaining good readability and clarity of the symbols. See EOTopo Online & EOTopo Downloads. The EOTopo download service was launched today enabling customers to purchase the 200K mapset via download (includes all files contained on the SD/USB plus additional formats such as MMR and TIF). Upgrade purchases can also be obtained via download. The all new download page also contains the previously available free files. To access the downloadable files in the EOTopo 200K mapset simply purchase the EOTopo 200K Download from the ExplorOz Shop. The download links are time limited and tagged to your registered ExplorOz user profile and computer. The window will refresh after the expiry timeout to ensure your links will always work. A major update to EOTopo 200K was released today - known as Release 2015. EOTopo 200K is available on either a micro SD card, or a USB exclusively from the ExplorOz online shop. All customers with earlier editions of EOTopo 200K are able to upgrade to the latest version by using the promo code that will be sent individually by email. As per our Lifetime Upgrade Plan, customers can elect to purchase the latest version of EOTopo 200K at the discount provided and via the method offered at the time. Currently, the method offered to existing customers to obtain the upgrade to Release 2015 is to purchase a new copy on hard media (SD/USB) via the ExplorOz online shop (using the supplied promo code to obtain the discount), although we will release a download upgrade option by November 2014. What's Changed in Release 2015? * added 5600 Camps/Accommodation POIs symbols to the map. Free camps (green tent icon), camps with fee (red tent icon), caravan parks (blue caravan icon), hotel/resorts (brown H icon). * added over 1500 Point of Interest features to the map Australia wide. These are indicated with a camera icon. * added 64 Roadhouses to the map. Indicated with a black R symbol. * added the latest Native Title Register (dated 2014) to show boundaries and names of determined aboriginal land. * removed many legacy data features & added newer data from ExplorOz Places database - these are all names & positions for Camps/Accommodation features, all Population features (Capital City, Suburb, Town, Place Name, Aboriginal Community, Station/Homestead), all Recreation/Point of Interest features, all Service/Quarantine features, all Infrastructure/UHF repeaters, and Infrastructure/P-Bay features, all Geography - Bay, Inlet, Cove, Beach, Cape, Headland, Point, Mountain, Peak, Hill, Pass, Gap, Island features, and all Heritage/Shipwreck features. EOTopo online is now also showing Release 2015 mapping. As previously, EOTopo online is a very different product to EOTopo200K as it is a vector-mapping system that allows map zooming with a wide range of map scales. EOTopo online is a free use product and requires an internet connection. See the EOTopo online tab for more details. Orange squares have been checked to 1:200K scale, Red have been checked and updated to 1:50K scale or better, Clear are yet to be checked, The Green lines are the actual roads that have been updated. The main bulk of the updates has been main road realignments and additions in the capital cities. These updates have been sourced from user treks, emailed updates, stored data, online map and satellite sources. The size of the text field for Textnote has been increased in roads to ensure all labels fit. Long labels have been re-worded. The Textnote field contains data such as restrictions, walk track follows, and other on-road notations. Walking Tracks: A whole new Heysen trail route has been added based on the latest alignments. The base data was missing many sections of this trail, so the entire trail was replaced with new data. The source level accuracy of this added data is better than 1:10K. Adjusted font size max and line width for all Walking Tracks to ensure easier identification and ability to follow all lines. Vertical Obstructions: Layer set to Title case. Updated output to ensure NAME and feature type will be displayed for elements that have a name. Affects: Tower, Lookout, Chimney, Mast, Wind Turbine & Silo. Removed duplicate titles from Textnote field to ensure no items are called "Black Mountain Tower Tower", for example. Adjusted font size max for cleared lines. There was no max value so it was possible for fonts to get too large when viewed in EOTopo Online at 1:54K scale. 200K Product: The whole country and each of the state images now includes a full legend with scalebar. This is a major update and therefore a new version of EOTopo 200K has been created. The latest version is now 2014. All stock in our warehouse is being switched over to 2014 and orders for the product will be held till the new 2014 stock arrives in the warehouse, which is expected 5th December. As of today, 1st December, all customers will receive the latest version. 2013.3 Under the Lifetime Upgrade Policy, customers who have previously purchased the 2013.3 release will be able to access the new version if desired. Details will be sent to directly to those customers. We have an excellent process running now in terms of the updates. We are rationalising the user supplied data from UserTreks and verifying the accuracy of these routes. We are building a really accurate view of this data and overlaying this on the main mapping product and we are able to adjust the road network with a really high level of accuracy. Before the roads data is updated we validate the data against the existing roads network, cross check it with Satellite and street level data and then apply updates. We have a new update key and are able to track the progress across the team. Here is a snap shot of the update work this week. So as you can see the whole of VIC is updated and this includes things link Eastlink, Mornington & Geelong Bypasses, the list is actually huge in VIC they have built a lot of roads. I am loading this new road database and several other layer updates to the server tonight and will start a flush of the tiles but this is not going to affect the release number - really it is a backup measure for me to ensure work to date is backup up on the web servers. The 2013.5 release is scheduled to go online still on the 1st Dec.
As promised the task of road data updates has started and these minor updates (well the task is major but the result is sort of minor) are being released into the online product as they are competed. There are a great number of updates needed before the next major release of the 200K product but work is under-way. All road names converted to title case. Database fields rationalised to remove unwanted GeoScience fields. Added new updated date field. Set-up correct GIS environment to support road data management. Converted the ExplorOzTile.map file to support new data select fields and naming changes. WA: Full re-alignment Forrest Hwy, Kwinana Fwy (North & South), Indian Ocean Drive and supporting nearby roads, minor realignments in the Perth City area. NSW: Full re-alignment Pacific Hwy, Sydney to Brisbane including all new 2013 dual carriageway adjustments. Supporting side roads and minor regional city adjustments to support major update to Pacific Hwy. These updates are now visible in the EOTopo Online system. NOTE: Your browser caching may not push update all tiles to your browser as there is a 7 day cache setting so if you have recently used the Online system and looked at a certain area you may not get the latest tiles. You can clear your browser cache if you really want to see the latest tiles. Another few solid weeks on EOTopo and we have now released the latest update to the online map server system. In this update we have finalised the Geoscience data layers and installed all available layer into the product. One thing we found was the the standard filters applied to produce the NatMap products made some attributes and features not visible on the Topo maps. We have addressed this and updated the filters to support our production 200K series output desire. So you are in fact getting more data on the EOTopo than was shown in the Natmap Topo products. We also increased the slopeshade display percentage for this release to make the relief really stand out. We have also published a legend for the maps and this is available from the EOTopo Online page or if you want to have a look now see the EOTopo 200K Legend. The tiles server is building the tiles on demand at the moment so some mapping tile displays may appear to be slow. If they are slow it is because you are the first to request the display in a certain area so in the background our map server will build the map and deliver the image to your computer (this takes about 10-15secs). Once it has built these tiles they are cached on our server system so that subsequent people who want the same tile will just get the image directly from cache. Hope you enjoy the latest updates to EOTopo Online, all ExplorOz map displays will be implementing these updates automatically. Well it did not take long to roll from 2013.1 to 2013.2 What has changed? Well a lot has happened in the last 48 hours, including the loss of my master development copy of everything I have done for the last 12 years (thanks Skydrive I will never use you again). I was able to recover from several backup sources and as it stands I believe I am 95% back to current. In terms of EOTopo however, I when I was testing the 2013.1 release I did not notice for several days that the palette table I was using (this is a colour reduction template to bring the images down in size and colour complexity) was the old one from the last tile set. This made the fancy new hill and slope shading look average. So decided to make a new template this morning and the result is back to awesome. Whist I was rebuilding the template I decided to have another look at road labels as I was not happy with the labels as they were too hard to read. So in 2013.2 we have all new road labels using a different font, outline colour and size. These are the main updates to the system and as at 12pm AEST 11th Oct the tiles are being rebuilt in the tile server - so for the next few days these tiles will be built progressively as people request areas of the map that have not yet been opened. If you see a pause in tile delivery this is most likely what is going on and it should complete the tile delivery within a few seconds so please wait it will reduce the load on the tile building programs. The online mapping server now supports the latest version of EOTopo. This new map set integrates the latest topographic map data for the whole of Australia with DEM Shaded Relief and ExplorOz data to produce the latest series of online topographic maps available for Australia. Release 2013.1 includes the full unfiltered GeoScience S3 Topo 250K data, SRTM DEM data and ExplorOz places data. This new topographic map set has been designed to scale best at 1:200,000 and is customised to render on electronic devices. Additionally the maps have been set-up for the best possible rendition of road data to suit on & off road based travellers. The addition of altitude colour, slope & hill shaded relief is a first in Australian online topographic mapping and provides a 3D look to a 2D map. The ExplorOz Treks road network has also been added to the map set to provide the latest updated road network for ExplorOz supported treks. The treks data is supported via a dashed purple line. UHF repeaters and several other Places data layers have been integrated to ensure the positional data is as accurate and updated as possible. Additionally the ExplorOz tile server that renders the data to the Internet has been updated to support the latest methods of tile generation via the production of tile grids on request. The tile grids are a 5 x 5 tile image that is then cut into the 25 separate 256x256 standard tiles. This method ensures the best possible label layout and a consistent colour blend across a range of tiles. If you want to have a good look at the latest map set check out EOTopo Full Screen. This now replaces the base map layer shown in ExplorOz Places (and also ExplorOz Trek Notes, User Treks, EOTrackMe, Shop, and all mapping outputs) in topo view. NOTE: If you notice errors, omissions or wish to supply any updates please provide as much information as possible and send this as email to updates@eotopo.com. We would generally suggest GPX format for any road data. Screen captures, or annotated images for any other error or omission reports. We will ensure that every submission is managed and added to the product. The purpose of this FAQ section is to outline the different setup processes (and options) for buyers of EOTopo – simply find the information that applies to you. To put EOTopo maps on a Hema Navigator you will import the files found in the OZF folder found on the EOTopo downloads page. You will then need to transfer both the .map and name search files to the Navigator’s SD Card. As there is limited space on this card, you will need to transfer specific files. Firstly, find the “OziExplorer Maps” folder on the Navigator’s SD Card and create a “New Folder”, name it something like “EOTopo Maps”. Then open the OZF folder on the EOTopo downloads page and transfer the following files to the “New Folder” that you have just created. and if you have the Premium License, you'll find there is not a single Australia.mp or Australia.ozf4 in the 144K scale. Instead, you'll have to download each of the 6 state files in the 144K scale in both the .ozf4 and .map formats. Then find the HNOZi Folder on the Hema’s SD, open it, and you should see a folder called “Name Search”. On the EOTopo downloads page you will also see a folder named “Name Search”, transfer the two files in the EOTopo’s “Name Search” folder to the Navigator’s “Name Search” folder. You can then use the functions found in Off Road Navigation on the device to load the EOTopo Maps, and EOTopo Name Search files. There are two navigation software options available on the VMS GPS devices. The first option is VMS Off Road. VMS GPS devices have a “VMS Map Converter” which can then be transferred to your computer and used to convert the EOTopo ECW files to the correct format. Instructions are found on the VMS FAQ page, (scroll to the “How do I add new off-road maps section”). The second option is OziExplorer CE (if trial version is installed you will need to purchase the CE upgrade licence). To use the EOTopo maps in OziExplorer CE, transfer the OZF4 and Name Search files as listed above for the Hema Navigator into the relevant folders for Maps and Name Search Data found on the VMS device or VMS SD Card. The EOTopo Lifetime Upgrade program allows current owners of this product to purchase new version releases at a greatly reduced price. 2018 EOTopo upgrade pricing is only $40 for the Premium or $30 for the Standard. Additional discount applies to those with Membership. into the Promo Code Field when purchasing. This code is not limited to the format previously purchased eg. if you purchased EOTopo200K previously you still have the option to purchase EOTopo Premium (144K) using this upgrade pricing. NOTE: Ensure you are logged into your ExplorOz account when making your purchase, as this code only works when logged into the same profile linked to your previous EOTopo purchase/s. Tom-Tom, Navman, Garmin and Magellan GPS Units, as well as some pre-installed vehicle Sat-Nav systems. Note: Android sat-nav systems are compatible if loaded with a compatible navigation app (eg. ExplorOz Traveller). A new MapScript program was developed by David Martin (I.T. Beyond Pty Ltd) to build tiles at 5000x5000pixels. The 200K final whole of the country image is built using 37 x 30 tiles of 5000 pixels. This produces 1147 tiles and is over 80.1GB of GeoTiff files. The 144K final whole of the country image is built using 50 x 42 tiles of 5000 pixels. This produces a staggering 2193 tiles and is over 153GB of GeoTiff files. The GeoTiff files used for the raster map products use a projection of WGS84 (EPSG:4326). This projection is in most respects exactly the same as GDA94 and was chosen as it is the worldwide standard for Lat/Long projected maps. These tiles are then processed into a Virtual Raster File. This is the bridging of each of the tiles into a single file so that it can be processed and rendered as a single image. The State definitions are made using QGIS – an Open Source Geographic Information System. The states polygon vector files were built from the GeoScience base framework layer with a buffer set around the state borders of 0.1 degrees. This ensures that the state borders are fully visible on each of the maps. Another process is then used written using GDAL - Geospatial Data Abstraction Library. This script cuts up the Virtual Raster into each state file. GlobalMapper (a GIS Data processing application) is used to create the GeoTiff and ECW files. The ECW State files use a 10:1 compression ratio and the Australia single image uses 15:1 compression (this reduces the quality a little of the single ECW tile). GeoTiff files were converted to the OZF4 file format (using the Neural Net Colour Reduction set at 70% and 256 colours) using the Img2Ozf program from OziExplorer. The OZF4 files total 7.04GB, the ECW files total 6.67GB and the ExplorOz Places Name Search totals 10MB.